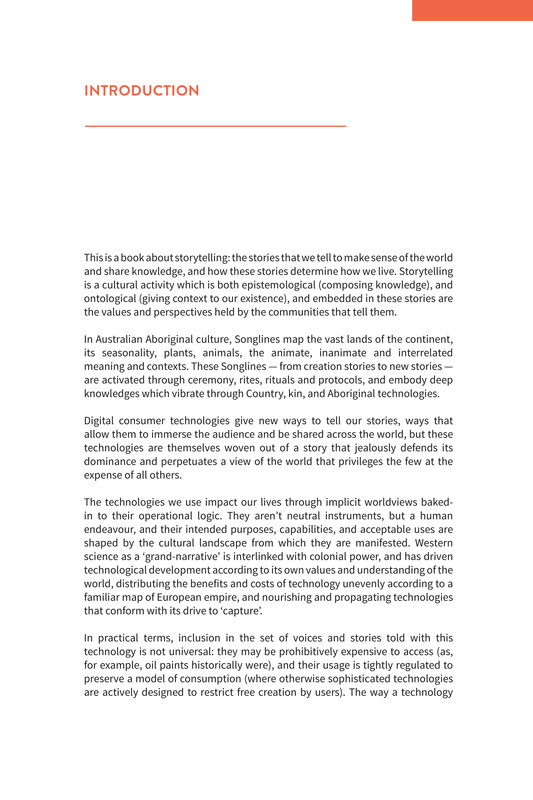 This is a book about storytelling: the stories that we tell to make sense of the world and share knowledge, and how these stories determine how we live. Storytelling is a cultural activity which is both epistemological, and ontological, and embedded in these stories are the values and perspectives held by the communities that tell them. Harle, Josh, Angie Abdilla, and Andrew Newman. 2018. “Introduction”. In Decolonising the Digital: Technology As Cultural Practice, 9-16. Sydney: Tactical Space Lab. http://ojs.decolonising.digital/index.php/decolonising_digital/article/view/Introduction.